Wicker Coconut Beach Natural Rattan Furniture Sets. 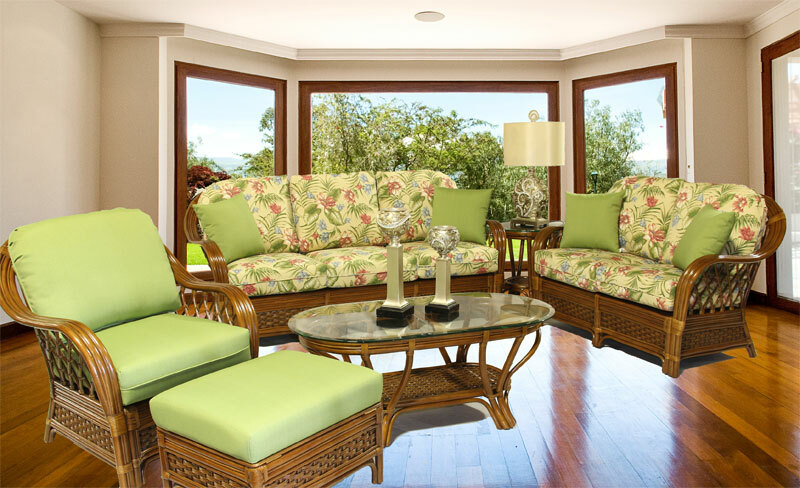 Coconut Beach Natural Rattan Furniture Sets. Scroll down to see this collection. Be sure to look at our Fabulous Group Priced Specials or make your own Group by mixing 4 or more pieces & enjoy a 15% Discount. Please call us to order 1-800-274-8602 press 0 Six days a week. Our Natural Rattan Coconut Beach Furniture Sets offers Beautiful Mahogany toned Seating & Dining. The dining tables are available in your choice of three different sizes. Construction..these frames are made from very sturdy rattan poles and lots of them. The area below the seat cushions & along the sides is solid woven. When an area is woven we refer to it as wicker. Wicker is not a material. It is a weaving process. In this case smaller textures of rattan are woven her. The lattice work on the furniture sides is slimer textures of rattan poles. Fabrics..select the fabrics you like best all at the same price! Deep seated frames that house plush, full size seat & back cushions. This is quality rattan furniture. We offer free Curbside delivery to MOST LOCATIONS in 48 States. Our deliveries are made in 18 wheeler trucks that must be able to drive onto & away from your delivery address. Ask about our sdhiping with this product. We do something special with it. You will be happy. 5 Piece Coconut Beach Natural Rattan Dining Set 48"
3 Piece Coconut Beach Rattan Dining Set 36"